Updates to sheryl (Sherrie)'s profile since your last visit are highlighted in yellow. BFA Univ of Georgia; MFA Cath. Univ of America, DC; studied art at Univ of Guadalajara, Mexico; taught art in Colorado; 71'-91' lived in DC and taught art in Bethesda, MD; (in between those years) lived in Nairobi, Kenya and married a Maasai author (divorced); 91' -94' taught on Navajo Reservation by 4 Corners, AZ: 94' moved to Tucson and first met my spouse Marco Basurto who is Yaqui Indian from Tucson. 95'-02' lived in Rockford to be with Dad who died of cancer. Married Marco Basurto in 2000. 2002 moved back to Tucson to continue teaching art (both Marco and I).09' moved back to Rockford to help with 93 yr old Mom and teach art at Lathrop elementary. 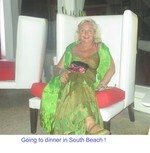 I have had an exciting adventuresome life traveling to about 35 countries, painting and teaching art 38 years!! sheryl (Sherrie) dorr has a birthday today.